It’s great being rich, you should try it sometime you impoverished oik! They should go and do something useful like cleaning up beaches IF they are environmentally conscious. Idle layabouts. I still don’t think it gets to the bottom of how they arrived at the figures. I am sure that there is an element of truth in the figures, albeit a distorted one. I am sure there’s no truth in anything ER and other ecofascist terrorist groups trumpet. Its all made up scaremongering. Only one mammal (a rare rat on a tiny pacific island) is known to have gone extinct in the last 100yrs. (Appears the rat was eaten to extinction by seabirds). Not quite. The island is no more than 3 m above sea level at the highest point. They were washed off in the latest storm. Honestly, they couldn’t even have existed long enough to have formed a new species, so saying a species went extinct is just another scientific fraud. The JNCC’s estimate – a little out of date – is for a national population of 580,000 AOBs (apparently occupied burrows). Allowing for a pair per burrow, that is a cool mill of the cheeky little chaps. If interested go to JNCC.defra.gov.uk and thence Home > Marine > Marine Biodiversity Monitoring > Seabirds and Seaduck > Latest population trends. After causing countless folk to be late for work, increasing pollution by causing traffic jams and giving the mayor and the police – who are doing their best to help Londoners, I would suggest that the rebellion is on its way to extinction. A good start would be if they led by example and made themselves extinct. Scientists probably kill (but won’t perforating something vital) world’s rarest turtle, pushed over the edge by destruction of river ecology by dams for ‘green’ hydro power in China. Only 12 years left for Griffin Vultures in Crete – 1000 left, wind turbines predicted to kill 84 per year. Fortuitously coincides with the predicted end of the world, so no matter. ‘Green’ schemes and science really aren’t helping are they? Burn the village to save the village – is that the expression? I had a reply from Extinction Rebellion about the source of the Puffin “fact”. “I’m sorry I have no information to add to my previous reply. Otherwise, the actual facts don’t matter. What do you expect, they are just spouting factoids to emotionally manipulate people. It’s not about the truth. It’s about destroying capitalism and imposing some sort of delusional socialist subsistence utopia. Monday being a working day, presumably all those demonstrators do not have jobs. They must then be definned as scroungers who are due to nothing of our Money, so just who is paying these idle folk? Surely not Ms Perry, or is it? Paul, I think the warming phase ended in 1998. Tony Heller’s videos show no warming since 1998. Heartland Institute Holocene history graphs also show we are now in a cooling phase. I wouldn’t give greenies any warming ammunition after 1998. If we are moving into a cooling period, these XR people are in for a tough ride, without heat from gas and coal. They seem very dangerous and uneducated to me. 2005/06 is considered to be the end of Modern Warm Period. Spaceweather is talking of a very low solar minimum but of course could never suggest it might affect our climate more than the magical CO2 does. trustafarian kids aiming at the wrong target, wound up by some malificent characters not least george suaron and politicized claptrap exhibits jejune comprehension of complex matters and in their ill considered hothouse groupthink, agitprop works illuminated shines a beacon on them: but not working for society but atomization and deconstruction, less than tools are all they are. What I’d like to really know, is HMG complicit, working behind the scenes in attempt to weaponize these kids and it wouldn’t surprise me in the least – if that were true, because with her, teresa may, anything and everything is on the table. Really? I think complacent and incompetent is closer the truth. XR should be made an illegal terrorist organisation, because using civil disobedience to blackmail a government is exactly that. XR are far more dangerous and organised than any of the far-right nut-jobs that are outlawed. Absolutely. If this was an EDL rally (are they banned in our totalitarian State?) the police would have waded in with batons flailing in full riot gear. Because this group are leftie extremists the Police are letting them alone to disrupt and terrorise the public. Such enormous double standards. At least with Euro elections coming we’ll be able to show our disgust at all those bums of all the parties in parliament. Only vote for parties NOT represented in parliament. Can’t even spell correctly either. Who is paying for these apparently full-time climate tricksters? Danged uncooperative Puffins. They deserve to go extinct for making pseudo-scientists and fake news purveyors look ridiculous. RSPB manager for Shetland Helen Moncrieff said that proper scientific methodology had been applied for the organisation’s statistics. 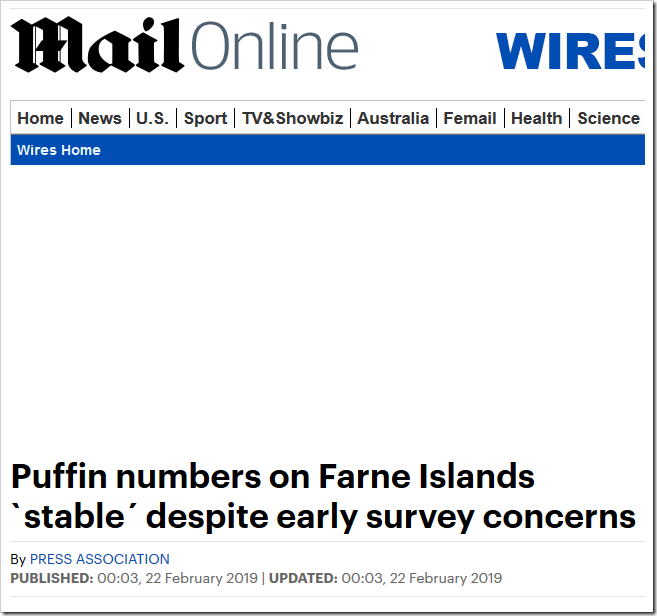 Despite that, caveats had to be applied, particularly when considering puffin figures, which showed a drop from 33,000 birds to 570 over 17 years. (A local guy said after the story said that contrary to the reported fewer than 600 puffins in Shetland, there were an estimated 500 at Sumburgh and over 1,000 in Noss. And no one speaks up cos they don’t want to lose their grants ? ..cos a low number is the best number for grants. 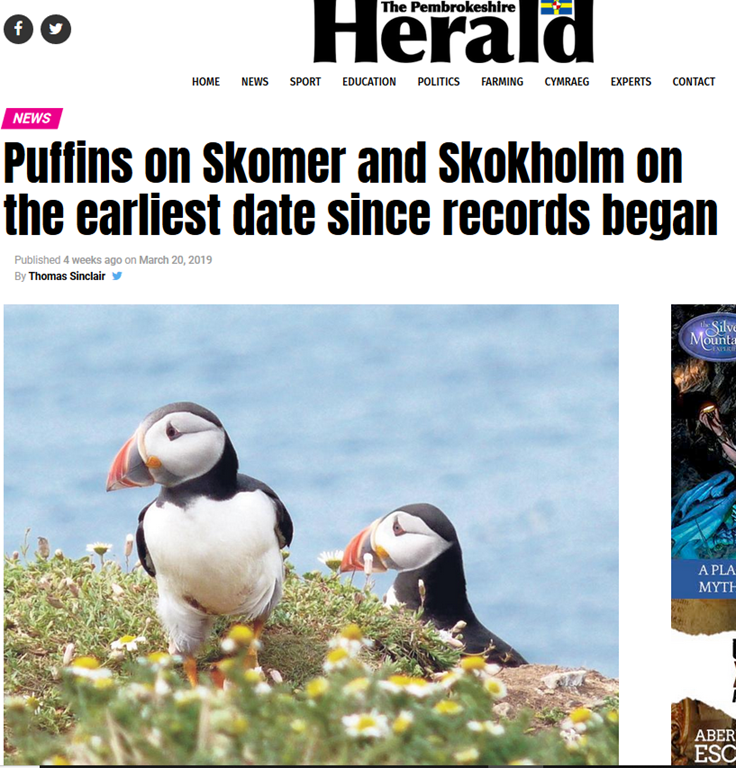 As I suspected, with absolutely no knowledge, the Puffins moved about, and its nothing to do with the overall population declining and climate change. I think its time to start getting seriously worried by the antics of these quasi-religious eco-loonies. They are starting to be a significant distraction to the smooth running of our society. Did you see Guido’s post today that the UK has the largest in-coming investments in the world? That won’t go on if London is brought to a standstill every week. They are supported by the media led by the Beeb and by their education; trying to reason with them (e.g. some posts here) is futile – they are fanatics like all fundamental religionists and stronger measures are called for – Boris’s water canons anyone? Even the (so called) government is pandying to them – see Clare Perry’s grovelling broadcast “we are listening….” There has to be a plan. To them, that’s a feature, not a bug. Indeed, it’s the feature; the “green” stuff is just there to recruit the useful idiots. It is illegal to obstruct a road, why are the police not doing their job? Maybe too busy investigating hate crimes on Twitter. Because they know that’s what they want them to do,. Maybe the Extinction Rebels could stop smashing Shell’s windows and go protest wind turbines instead. The carnage these horrible things are causing to wildlife is horrendous, and a real species extinction threat, unlike non-existent global warming. No a mostly white privileged group of socialists then? And maybe this is a fair representation of the type of people who go for cults like Extinction Rebellion. Obviously never to logic or science classes. A related question as it is to do with counting. 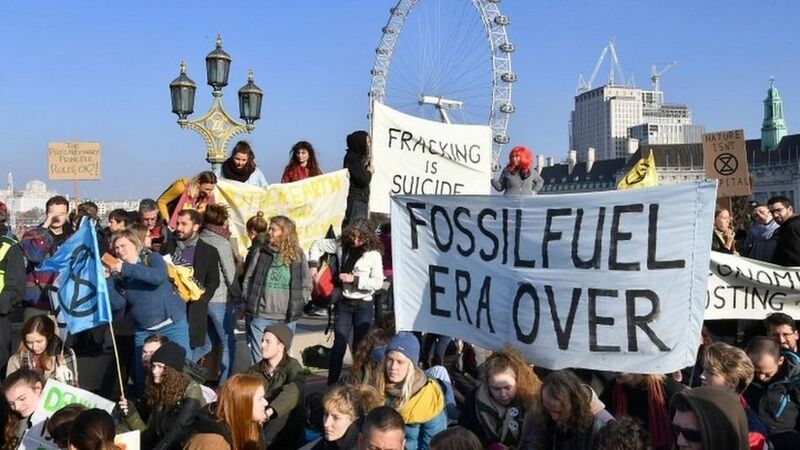 Has anyone found an answer to exactly what those involved in organizations such as Extinction Rebellion mean when they say ‘Stop climate change’? How do they define the word ‘stop’? Does it mean for a number of years or forever? If they mean for the climates of the world to stay the same for an extended period of time and assuming that their campaigns do reduce carbon emissions to zero, just how do they intend to eradicate all the other factors that cause climates to change? So the earth is dead and her main concern is that she cannot have babies? Sounds a bit of a selfish attitude to me. Another protester, (Ben Moss) talked of government inaction, but there has been action and the UK response has been greater that most countries. Maybe they should demonstrate in China and India, and see what response the receive in those countries. is that they want EVERYONE else to PAY for the costs of their plans both in money & loss of freedoms. The ER movement is not democratic. They want to impose their minority views on the rest of society. If they are democratic they should put up candidates at elections and how many votes they get. Is it just a coincidence that the broadcast of Attenborough’s “Climate Change the Facts”, is at the same time as these demonstrations? It almost seems that the BBC is joining in with the pressure group. The BBC is in the hands of the eco-nutters, the increasingly demented Attenborough is now the High Priest of this barmy religion. Does she actually think that all of these weather events are caused by “climate change” and will not happen in the future if we prevent further temperature rise. The really annoying thing is that there is no one at the BBC to challenge these claims.